How Do You Know if Your Air Ducts are Dirty? You may never think about your HVAC system or the ducts channeling the air throughout your home until a problem arises. What you may not realize is that problems are already happening right under your nose. The HVAC system may be polluting the air in your home, making it more difficult to breathe. Dirty air can also lead to respiratory problems. But how do you know if your air ducts are dirty? Read below to find out more. If your energy bills seem to get higher each month, it could be dirty air in the ductwork. Dirty air can clog up your HVAC system, causing it to work harder than it should. The result is higher energy usage, thus, higher utility bills. 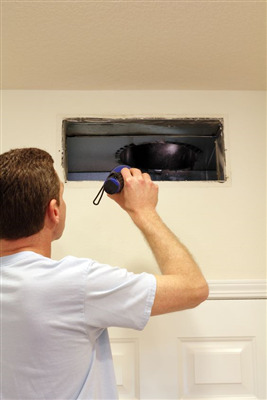 A professional air duct cleaning from Dust Doctors can improve your system's efficiency and reduce your bills. Check the air vents around your house. If there is dust, cobwebs, or dirt around the vents, you can be sure that it's in your HVAC unit and ductwork. As air passes through the vents, the dust can collect around blades and the edges. Every time the air circulates, more dust collects. The dirtier the vents, the dirtier the system. It’s time for Dust Doctors to clean your air vents. If you or members of your family are having an unexplained allergy, sinus condition, asthma, or other respiratory problems, excessive dirt and debris circulating through your ducts may be the problem. Air cycles through your home an average of six to eight times a day. Polluted air can have a negative impact on your respiratory system and cause health problems. Although the Minnesota area does not have high levels of humidity and moisture, mold can still grow in homes that have poor ventilation and contaminated air. Mold occurs when moisture builds in the system due to blockage of the ducts. This problem occurs in the summer months because cool AC air produces moisture. Like dirty air, mold can also cause health problems. If the air in your home is dirty, then it's time for a professional duct cleaning from Dust Doctors. We offer comprehensive HVAC cleaning, duct cleaning, and vent cleaning for homeowners in the Twin Cities area. You can count on us for affordable rates, quality work, and efficient service. Don't let the dirty air in your home cause your bills to skyrocket and your health to suffer. Call us today at 651-319-9777, or you can message us on our contact page.